The middle ear is sandwiched between the external and internal ear. The middle ear (syn. tympanum, tympanic cavity) is a narrow slit-like air filled cavity inside the petrous part of the temporal bone. Via its medial wall 3 auditory ossicles carry sound vibrations from tympanic membrane in its lateral wall to the internal ear. From front to back, the diverticulum is composed of pharyngotympanic tube, tympanic cavity and mastoid antrum. The tympanic cavity is actually the intermediate portion of a blind diverticulum from the respiratory mucous membrane of the nasopharynx. In a section via long axis of petromastoid bone, the outline of tympanic cavity along with mastoid antrum and pharyngotympanic tube resembles a pistol, the nozzle being represented by the tube, the body by tympanic cavity and manage by mastoid antrum. The middle ear is shaped like a block, compressed from side to side. In coronal section, it resembles a biconcave disk, like a red blood cell. In the centre: 2 mm. At the floor: 4 mm. Anteriorly with nasopharynx via pharyngotympanic tube. Posteriorly with mastoid antrum and mastoid air cells via aditus to antrum termed aditusadantrum. Contents of the Middle Ear. 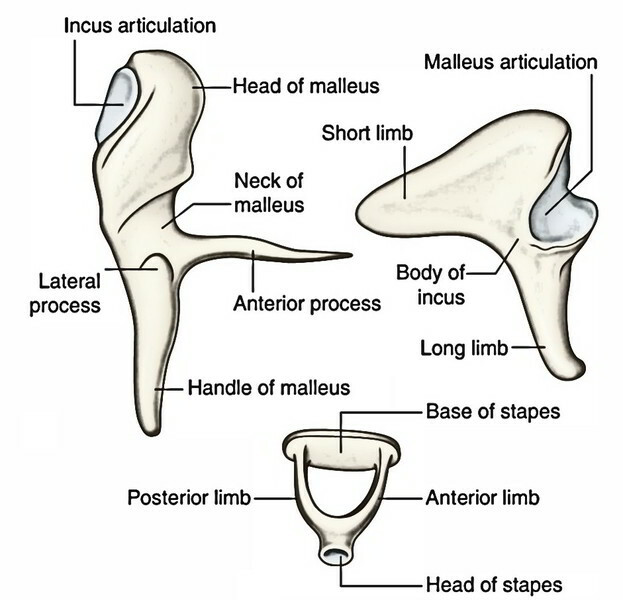 3 small bones named ear ossicles: malleus, incus and stapes. 2 muscles: tensor tympani and stapedius. 2 nerves: chorda tympani and tympanic plexus. Vessels supplying and emptying the middle ear. 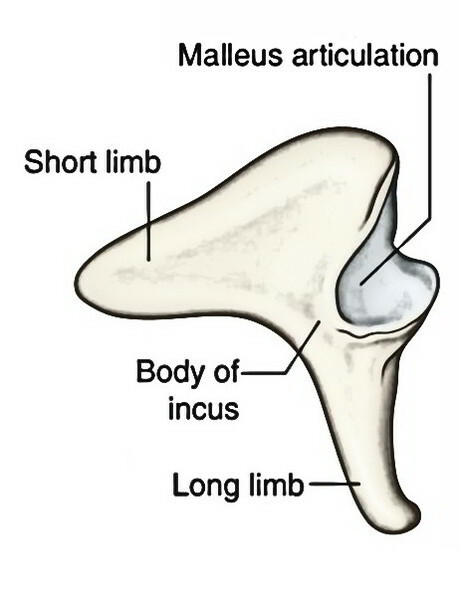 Ligaments of the ear ossicles. The mucous membrane lining of the middle ear invests all the structures inside it and creates several folds, which project into the cavity supplying it a honey comb look. So strictly speaking, the middle ear includes only air. The tympanic cavity goes substantially past the limits of tympanic membrane, which creates its lateral boundary. It’s split into 3 parts, viz. 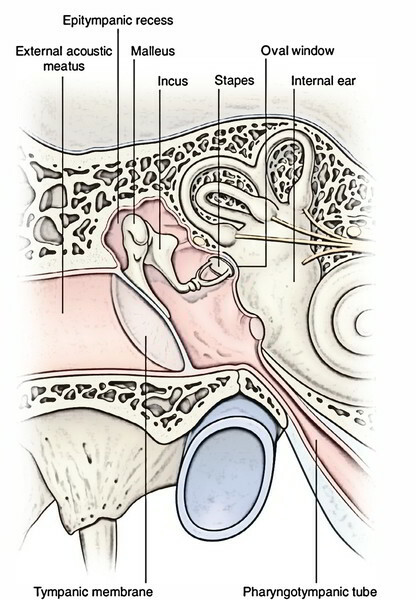 Epitympanum (loft), a part above the tympanic membrane consisting of head of malleus, body and brief process of incus. Mesotympanum, a part opposite to tympanic membrane comprising handle of malleus, long process of incus and stapes. It’s the narrowest part of the middle ear. 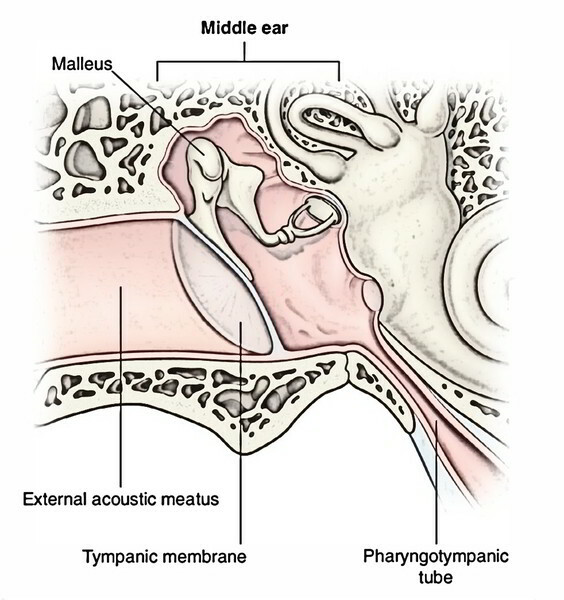 Hypotympanum, a part below the tympanic membrane. Roof: It’s created by a thin plate of bone referred to as tegmen tympani. It divides the tympanic cavity from the middle cranial fossa. The tegmen tympani also go posteriorly to create the roof of aditusadantrum. Floor: The floor is also created by a thin plate of bone, which divides the tympanic cavity from the jugular bulb. Occasionally it’s congenitally deficient and the jugular bulb subsequently projects into the middle ear, being divided from cavity only by mucosa. The tympanic branch of glossopharyngeal nerve pierces the floor between the jugular fossa and lower opening of the carotid canal and enters the tympanic cavity to take part in the formation of tympanic plexus. Anterior wall: It’s created by a thin plate of bone. In the lower part it divides the cavity from internal carotid artery. The upper part of anterior wall presents 2 openings or ducts, the upper 1 for the tensor tympani muscle and the lower 1 for the auditory tube. The bony partition between both ducts goes backwards along the medial wall in the tympanic cavity as a curved lamina named processuscochleariformis. Aditusadantrum, an opening in the upper part via which tympanic cavity interacts with the mastoid antrum. Fossa incudis, a small depression close to the aditus, lodging the brief process of the incus. Pyramid, a hollow conical bony projection below the aditus comprising stapedius muscle whose tendon appears via its peak, enters forwards to be connected to the neck of the stapes. Vertical part of facial canal runs in the posterior wall just behind the pyramid and descends up to the stylomastoid foramen. Posterior canaliculus for chorda tympani, a small aperture for development of the nerve. Promontory, a rounded bulge in the middle master-duced by first (basal) turn of the cochlea. The tympanic branch of the glossopharyngeal nerve ramifies on it to create tympanic plexus. Oval window (fenestra vestibuli), a reniform aperture situated above and behind the promontory. It’s closed by the base of stapes and annular ligament. Round window (fenestra cochleae), a small round opening below and behind the promontory which in life, is closed by fibrous secondary tympanic membrane. The secondary tympanic membrane divides the middle ear from the scala tympani. Sinus tympani, a depression supporting the promontory between fenestra vestibuli and fenestra cochleae, which signals the position of ampulla of the posterior semicircular canal. Bulge of oblique part of the facial canal that goes backwards and downwards above the oval window until it joins the vertical part of the facial canal in the posterior wall of the tympanic cavity. Occasionally the bony covering of the facial nerve could be absent, hence exposing the nerve for injuries and infection. Bulge of lateral semicircular canal of the internal ear that is viewed as a small ridge high up in the angle between the medial and posterior walls. Lateral wall: the Majority of the lateral wall is composed by tympanic membrane, which divides the tympanic cavity from the external auditory meatus. The chorda tympani nerve, a branch of facial nerve enters across the tympanic membrane being located lateral to the long process of the incus and medial to the handle of the malleus. It enters the tympanic cavity via the posterior canaliculus in the posterior wall and leaves via the anterior canaliculus medial to the petrotympanic fissure. Acute mastoiditis and mastoid abscess, when infection spreads into mastoid antrum and mastoid air cells via aditusadantrum in the posterior wall. Meningitis and temporal lobe abscess may happen, if infection propagates upwards via the thin roof (tegmen tympani). Lower motor neuron type of facial palsy, when infection erodes the papery thin bony wall of facial canal. Transverse and sigmoid sinus thrombosis, when infection spreads via the floor. Labyrinthitis, when infection spreads deep into medial wall. The labyrinthitis causes vomiting and vertigo. Cerebellar abscess, when infection spreads too much posteromedially. The 3 ear ossicles (malleus, incus and stapes) inside the middle ear are joined to 1 another by synovial joints and create a bony chain that stretch across the tympanic cavity from the tympanic membrane to the oval window . They conduct sound vibrations from tympanic membrane to the oval window and afterwards to the inner ear fluid. It resembles a hammer and, thus, called malleus. Its head, neck, manage (manubrium), a lateral process and an anterior process. The head and neck be located in the epitympanum, while the handle is embedded in the fibrous layer of tympanic membrane. 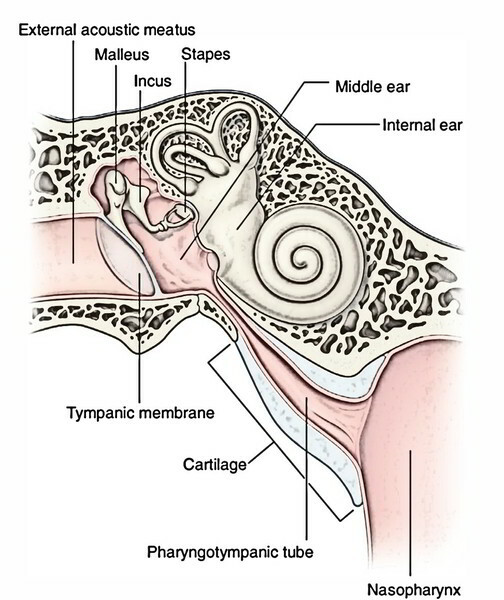 The lateral process creates a knob-like projection on the outer surface of the tympanic membrane and gives connection to the anterior and posterior malleolar folds. 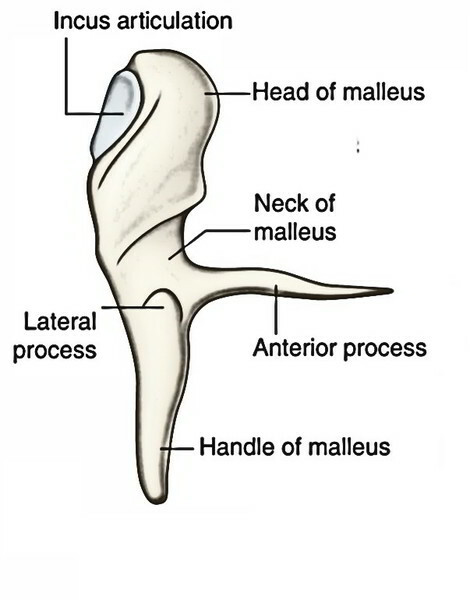 The head of malleus articulates with the body of the incus creating the incudomalleolar joint (saddle type of synovial joint). It resembles an anvil or a premolar tooth in shape. It is composed of a comparatively large body and 2 thin processes: a brief process and a long process. The body and brief process be located in the loft, on the other hand its long process hangs vertically behind and parallel with all the handle of the malleus. Its bulbous tip (lentiform nodule) is directed medially to articulate with the head of the stapes, creating the incudostapedial joint (ball and socket type of synovial joint). It resembles a stirrup. It is composed of head, neck, anterior and posterior crura and footplate. The footplate shuts the oval window and is connected to its margin by annular ligament. There are just two intratympanic muscles: tensor tympani and stapedius. Origin, insertion, Nerve Supply and activities of the intratympanic muscles. Hyperacusis: Both, tensor tympani and stapedius contract reflexly and simultaneously to dampen quite loud sounds, consequently preventing sound trauma to the internal ear. The paralysis of stapedius ends in hyperacusis (an abnormally increased power of hearing) where even whisper appears as sound. Otosclerosis: Abnormal ossification of annular ligament, which anchors the footplate of stapes to the oval window is termed otosclerosis. This impedes the movements of stapes and causes deafness. The otosclerosis is the most frequently encountered cause of conductive deafness in adults. The middle ear is supplied by 6 arteries, viz. Anterior tympanic branch of the maxillary artery. Stylomastoid branch of the posterior auricular artery. Petrosal branch of the middle meningeal artery, running along the greater petrosal nerve. 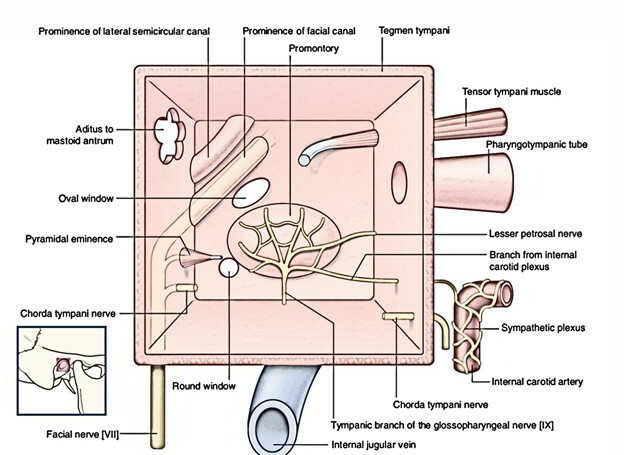 Superior tympanic branch of the middle meningeal artery, running along the canal for tensor tympani. Branch from the artery of pterygoid canal. Tympanic branch of the internal carotid artery. Out of the 6 arteries, first 2-anterior tympanicbranch of the maxillary and stylomastoid branch of theposterior auricular artery are the principal source of the bloodsupply. Pterygoid venous plexus, via squamotympanic fissure. Superior petrosal sinus, via subarcuate fossa. Upper deep cervical lymph nodes. 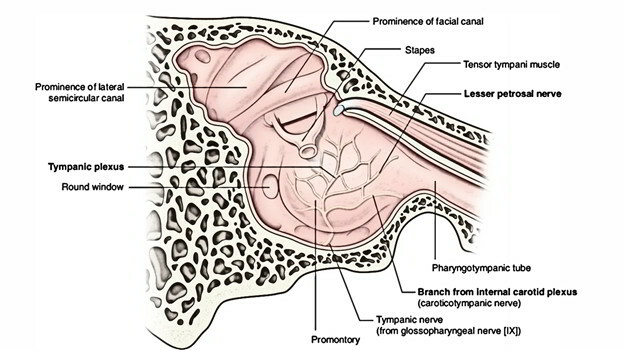 Tympanic branch of glossopharyngeal nerve: It enters the middle ear via a canaliculus in the floor of the tympanic cavity and takes part in the formation of tympanic plexus. It gives Sensory Supply to the liner of middle ear, antrum and auditory tube. Superior and inferior caroticotympanic nerves: They’re vasomotor and originated from sympathetic plexus around the internal carotid artery. 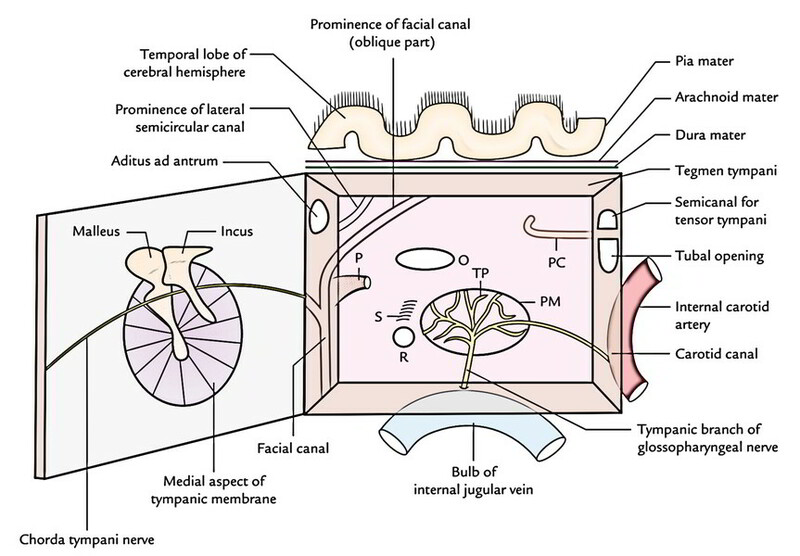 Facial nerve: It runs in the bony canal along the medial and posterior walls of tympanic cavity and supplies rise to 3 branches, viz. Chorda tympanic nerve, which (i) carries taste sensations from anterior two-third of the tongue with the exception of vallate papillae and (ii) gives secretomotorfibres to submandibular and sublingual salivary glands. Greater petrosal nerve, which gives secretomotorfibres to lacrimal, nasal and palatal mucous glands. Mandibular nerve: It gives motor fibres to tensor tympani muscle. The tympanic plexus supplies mucous membrane of the middle ear, mastoid air cells and bony eustachian tube. The lesser petrosal nerve originated from it includes secretomotorfibres of glossopharyngeal nerve to supply the parotid gland via otic ganglion. Referred pain of ear: Since the middle ear and external ear are supplied by the branches of trigeminal (CNV), glossopharyngeal (CNIX) and vagus (CNX) nerves, the pain in the ear (otalgia) is frequently referred to other regions supplied by these nerves, example, tongue, teeth, tonsil and pharynx. It’s a large airconsisting of space in the upper part of the mastoid process. It interacts anteriorly with tympanic cavity via aditusadantrum. Its roof is composed by tegmenantri that is the backward continuance of tegmen tympani. It divides the antrum from middle cranial fossa. The lateral wall of the antrum is composed by a plate of bone that is on an average 1.5 cm thick in the grownup. (It’s only 2 millimeters thick in a newborn.) It’s indicated on the surface of mastoid by suprameatal triangle (McEwen’s triangle). The floor of antrum gets the openings of mastoid air cells. Its posterior wall is related to sigmoid sinus on the other hand its medial wall gifts bulging of the lateral semicircular canal. 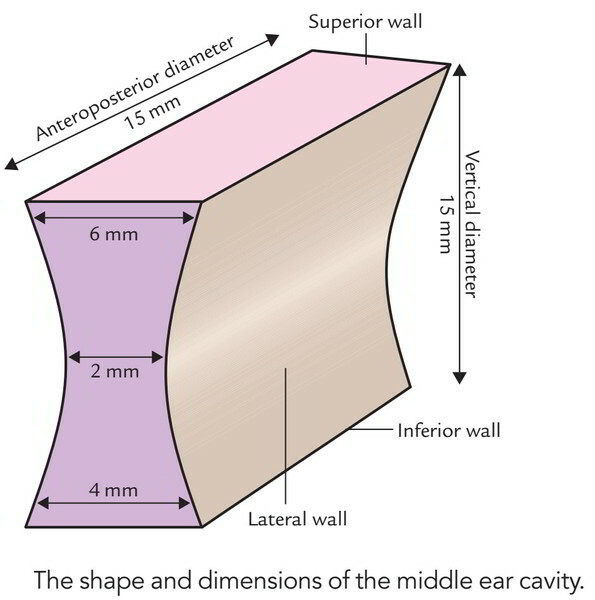 Mastoid antrum grows as a backward expansion of tympanic cavity and assumes the total adult size at birth. The mastoid abscess is a standard affliction. The antrum is approached surgically via its lateral wall. Thus it’s essential to measure the limits of suprameatal triangle. This triangle is bounded above by supramastoid crest, anteroinferiorly by posterosuperior section of bony external auditory meatus and posteriorly by a line drawn as a tangent to the posterior margin of the bony meatal opening. The pharyngotympanic tube (auditory tube) is an osseocartilaginous tube, which attaches the nasopharynx with tympanic cavity (middle ear). It’s directed downwards, forwards and medially from the tympanic cavity to the nasopharynx. The auditory tube preserves equilibrium of air pressure on each side of the tympanic membrane for its appropriate shaking. The auditory tube and middle ear grow from endodermal tubotympanic recess, which originates from the very first pharyngeal pouch (and partially from second pharyngeal pouch). The mastoid antrum grows as an expansion of the middle ear cavity into the mastoid process. The malleus and incus grow from mesoderm of the very first arch. The stapes grows from mesoderm of the 2nd arch with the exception of its foot palate and annular ligament that are originated from otic capsule.